Say hello to our new favorite breakfast! We’ve been on a smoothie kick for-ev-er so I’m a little caught off guard by the switch, but this granola is so good, I’m sticking with it. I had a weird craving a couple of weeks ago that went on for days. I don’t know why, but all I could think about was a fruit and yogurt parfait with granola. 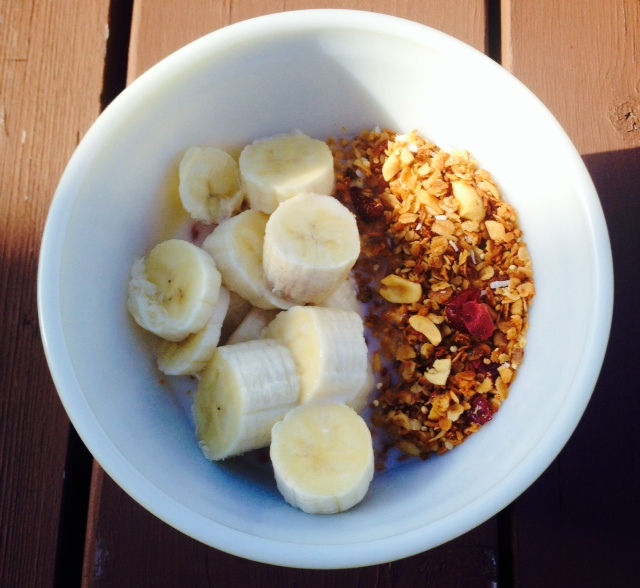 I’m not a big fan of store bought granola, so I tinkered around and found a version I’m really happy with. In a late game decision, I added some uncooked quinoa for crunch and a little bit of protein and I’m so happy with the texture it gives. We also love Craisins in everything so that was a no-brainer. I also used only peanuts because my Main Taste Tester is allergic to all other nuts, but I know this would be awesome with other nut combos. If there is ever a time where he’s away for a while and I know I have no chance of killing the guy, I will be adding some pecans in there. True story. This is delicious with milk and banana slices or layered with vanilla yogurt and strawberry preserves in a parfait. Make yourself a treat for breakfast! Preheat oven to 350 degrees. Line a baking sheet with parchment paper or foil and set aside. Combine the butter, honey, brown sugar and vanilla in a small saucepan over medium low heat. Cook until melted and starting to bubble. Put the oats, quinoa, half of the coconut, peanuts and cinnamon in a large bowl. Pour the butter/honey/brown sugar mixture over it and stir until everything is well mixed. Spread on the prepared baking sheet and bake for 25 minutes or so, stirring a couple of times during cooking to avoid burning. When everything is slightly browned, remove from the oven and let it cool completely. Then mix in the rest of the coconut and the cranberries. Store in an airtight container.